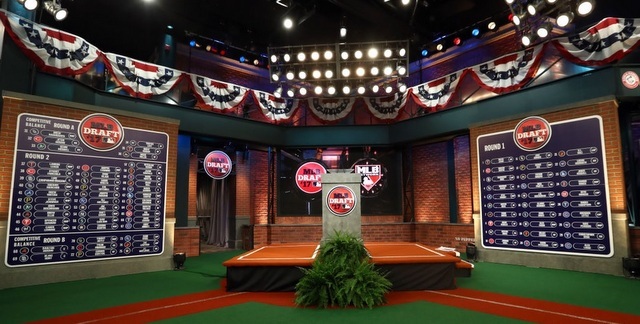 Baseball’s annual three-day amateur draft will begin in a little more than six weeks and, as always, MLB Network will broadcast Day One. Based on previous years, the broadcast will cover 74 picks on Day One, stretching from the First Round to Competitive Balance Round B. The Yankees will have two picks that first day. At some point soon, perhaps later this week, I’ll begin profiling draft prospects and potential draft targets for the Yankees. Here’s the draft profile I wrote about Aaron Judge back in 2013. The profiles will look similar again this year. That format seems to work well. Here are a few draft notes six-plus weeks out from the main event. The Yankees will be in Detroit to play the makeup doubleheader on the first day of the 2018 draft, so that’ll be a nice and chaotic day. If MLB wants to draw more attention to the draft, they should hold it on a universal off-day, or at least at night with only day games scheduled. Maybe one day. The draft order is mostly final. The only possible changes at this point are Competitive Balance Lottery picks potentially getting traded. Usually one or two change hands each summer. The Yankees have yet to trade for one, but it doesn’t mean they haven’t tried or won’t try this year. Those picks don’t have much value anyway. In a all likelihood the Yankees are locked into their current picks. Wong is currently viewed as more of a second or third round pick, though he’s also seen as someone who could climb draft boards with a strong spring. He owns a 2.29 ERA with 56 strikeouts and 15 walks in nine starts and 52 innings so far this season. McDaniel says Wong has a 92-96 mph heater and a pretty generic array of secondary pitches. Wong is the first player we’ve heard connected to the Yankees this draft season, and it is notable Oppenheimer watched him. The scouting director usually only goes to see the kids who get glowing reports and are firmly on the team’s radar. Then again, it’s entirely possible Oppenheimer was in Phoenix to scout other players, and decided to stop by to see Wong in action. In recent days Baseball America and FanGraphs have updated their 2018 draft prospect rankings. Baseball America’s list run 300 names deep at the moment. Eventually they’ll stretch it out to 500 names based on previous years. Keith Law (subs. req’d) and MLB.com haven’t updated their lists in a while. As always, MLB.com’s scouting reports are all free. Can’t beat it. Generally speaking, the 2018 draft class is viewed as better and deeper than the 2017 draft class. There is not a clear cut No. 1 prospect, however. Florida RHP Brady Singer was the top guy coming into the spring, but his stock has since taken a hit. He’s had an uneven spring and he failed a pre-signing physical with the Blue Jays as their second round pick three years ago, which won’t help his stock. The Yankees tend to favor college players early in the draft, but, as they showed with Blake Rutherford in 2015, they will jump on a highly regarded prep player who falls. Also, the Yankees are all about Southern California. Oppenheimer is a SoCal guy and he’s mined the area heavily during his tenure as scouting director. I see no reason to believe that will be different this year.